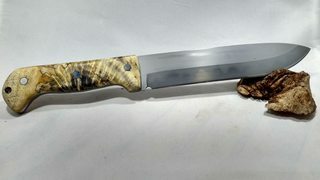 I'm becoming interesting in knife making as a hobby. I know absolutely nothing about it and this post is more or less the complete beginning of my journey. The only thing I have done so far is watch videos of others making knives. My question is about two methods I have noticed that are used to create the blade. The first and apparently most common that I have seen is that people will begin with a thin rectangular bar of metal, literally draw the shape of a blade on it with a marker, and then cut around it and grind it down with power tools. The second is people will use a fire to heat some metal and beat on it with a hammer and anvil until it is the shape that they want. Now I don't mean any disrespect to anyone but the first method is not at all what I was expecting when I started researching this. I suppose with mass fabrication of materials it is an accessible option, but to me it seems cheesy almost. I'm sure it still requires skill but there's something about the idea of cutting the shape of a knife out of a pre-made bar like it's playdough that seems off to me. Are these the two main ways of forming a blade? Is it true that the first is much more common? Do each of these processes have a name? Stock removal is the name for the second method youre badmouthing, and theres nothing 'cheesy' about it. 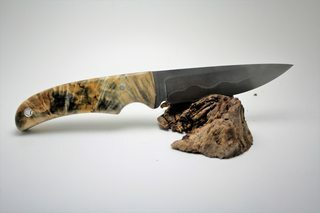 Id invite you to go out and try making a knife by grinding it out, after about 17 you might end up with something usable. It takes just as much skill to make a stock removal blade, just a different sort of it. Forming the blade is a small part of the overall process to begin with, equally important are heat treatment and fit and finish. If you dont want to disrespect someone, maybe dont compare their craft to "cutting the shape of a knife out of a pre-made bar like it's playdough". Its rather disrespectful. But hey, just punched holes in play-dough, right? Don't let Epic bug you, you stated very plainly you did not mean to disrespect anyone. No Sunday night chat Ray? When setting out to learn something new, you will only hinder your ability to learn it if you start off assuming you know how it SHOULD be done. Even with forging you will still need some stock removal to clean up. The more techniques you learn the more tools youll have to work with. i dont mean literal tools, but those will come too in time. Ive done both forging, and stock removal. As has been mentioned there are benefits to both methods, and materials you cant forge with. The hammer has less to do with how good the knife will be as the heat treat. Last edited by damon; 04-22-2018 at 09:49 PM. OK people, let's not get all defensive..... the OP asks valid questions, and rather than trying to slap him down, why not take the opportunity to educate? To the questions, the two methods are the ones commonly use to produce custom knives....and there are many various levels of each method. Stock removal is by far the most common method....because it can be accomplished in nearly any location, requires fewer tools, and has a shorter learning curve then forging. With the era of FIF (Forged in Fire) knifemakers, there is a LOT of forged junk floating around out there..... made by people who take neither the time nor input the effort to learn/understand what it takes to produce a quality forged blade. But, on the other side of the coin, it has introduced Knifemaking/Bladesmithing to many who never thought of, or considered knifemaking/bladesmithing..... this in itself could explain the OP's view on methodology. Since you are just starting out, my recommendation is to seek out a knife maker or group in your area and go over and spend an hour or two and see and talk about what’s involved. What you are about to start is a very complex craft. Some people take years to get to a point they can turn out great blades on a consistent basis. Implying they might be cheesy isn’t starting out on the right foot. Don’t think there is only one good way to make a blade. I happen to do stock removal. I have a compleat forging set up but hate that part of the process so focus on what I do like. And as stated above, you can’t exactly set up a forge on a confined space like an apartment! I’d recommend you fill out your profile better and let us know where your located. You’ll be amazed by how many blade smiths are hidden around you. Also people like a name. If you tell us a little about yourself and what kind of shop, tools you have we can better let you know about your options. The stock removal method is a simple approach into knife making due in part to the space requirements. A wide variety of tools that can be used to perform the task from files to disc grinders and so on. If forging, you'll have to have some room as well as a place that doesn't provoke the irritation of your neighbors that may hear the hammering of steel. Both generate their own noises so one for the other in that respect. If the challenge of making your own steel draws you, then forging is worth the pursuit. With stock removal, the steel is already ready to go in varying types of offerings (Carbon, stainless) for shaping and when done sent out for heat treating. Then doing the final clean-up and handle work. OK As CNC CUTTER SAID WELCOME TO THE FORUM! !